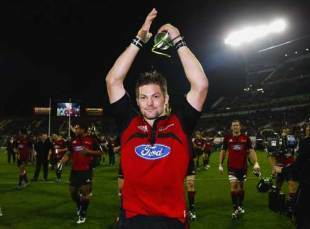 Crusaders skipper Richie McCaw revelled in another victorious season and the end of an era at the franchise. "There was a lot of emotion out there and I guess there will be more tonight," he told Sky Sports. McCaw sensed his side were getting on top at halftime and that it was a matter of time before they hit the front. "We had played a lot of the rugby. When you've got the ball and you're breathing pretty hard, well you hope that they are too, making all those tackles," he said, acknowledging his side stepped up to another level while Thorn was sidelined. "At times like that you have to really dig deep. When you're down to 14 it sometimes hardens your resolve even more." His opposite, Waratahs skipper Phil Waugh, was magnanimous in defeat. "They deserve to win the title, they won the round robin convincingly and we were outplayed tonight so good on them," he said. "I said before game it was about 80 minutes and we just didn't go on with it after halftime. "We didn't score a point in that second half ... the difference was probably the amount of pressure inside our own half." Departing coach Robbie Deans said he had no regrets about his decision to leave the franchise he has guided to multiple successes. "I consider myself incredibly lucky to have been part of this organisation," he said. "None of us are here forever, people come and go. The critical thing is that it carries on. I've got no doubt that it will and I look forward to coming back and being entertained by these blokes." When asked how he would spend the day tomorrow he replied, "packing". He starts his new role on Monday, when he will announce the Wallabies squad in Sydney.